Church leaders gathered in Oban Church Centre on Thursday morning, 15th June, for a Civic Prayer Breakfast for the local community. The main speakers were Mr Mark Kitson, of the Cinnamon Network, who spoke about the contribution of Faith Groups to the community across Scotland, and Ms Caroline Fothergill, Head Teacher of Rockfield Primary School, who spoke on current challenges and needs in Education. Mr Neil Matheson was interviewed about the aims and needs of the local Business Community. Guests included local Councillors and representatives of the business community and the third sector. 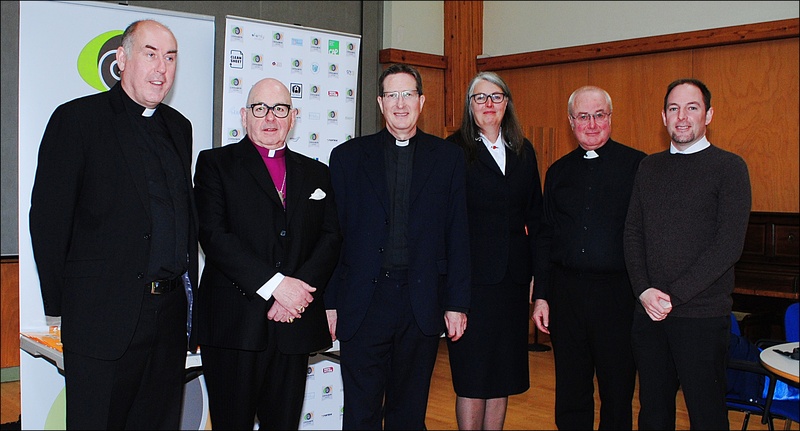 The photo shows, left to right: Rt Rev Brian McGee, Bishop of the Roman Catholic Diocese of Argyll and the Isles; Rt Rev Kevin Pearson, Bishop of the Episcopal Diocese of Argyll and The Isles; Rev Dugald Cameron, Church of Scotland Minister of Kilmore and Oban, and Moderator of Argyll Presbytery; Mrs Catherine Sheldrick, of the Salvation Army; Monsignor James MacNeil, St Columba’s RC Cathedral , Oban; and Rev Stuart Lawson, Minister of Oban Baptist Church.